Born in Germany and raised in the U.S.A, Brigitte Elliott has been knitting since age 9. She has degrees in fine art and medical assisting. Much of her adult life involved raising three children, elder care, and supporting her husband’s orthodontic practice. 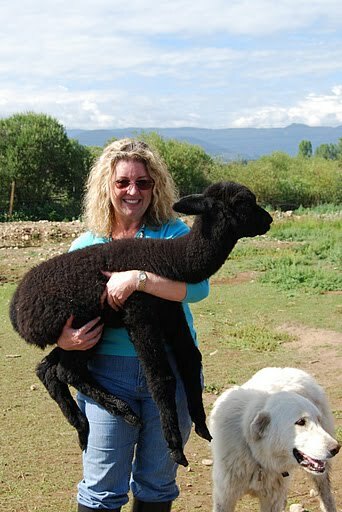 In 2007 when her kids were grown and her husband nearly retired, she fell in love with alpacas and their yarns, acquired several, and within her, a renewed passion for knitting resurrected. She began teaching in knitting stores in both Colorado and Florida. In 2010, she found an opportunity to learn a “new” and exciting technique. It was so innovative that she went to Germany to learn the short-row technique from its creator, Gabrielle Kluge. Afterwards Brigitte secured the rights to teach Swing-Knitting™ workshops developed by Heidrun Liegmann. She teaches her brand of Swing Knits® courses in local yarn shops all around the U.S.A., at Lonesome Stone Natural Fiber Mill and Alpacas, and at The National NeedleArts Association (TNNA) and XRX, Inc., Stitches events. She continues to create new works of art for Swing Knits® as well as Skacel Collection, Inc. and XRX, Inc., Knitter's Magazine.